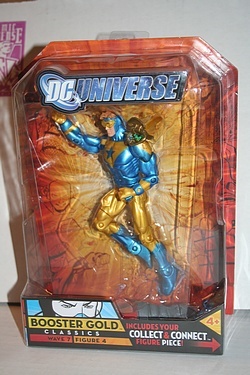 Let's check out a figure from wave 7 of the DC Universe Classics collection, Booster Gold! Michael Jon Carter traveled through time gathering powerful artifacts to invent his super persona in the 20th century and the horsemen have made a great figure of him. There are two versions of this figure in series 7, this one is the 'classic' version. Click on the image below for his bio and more pics...and collect all of wave 7 to create the Atom Smasher figure!